Astrobotic Technology, the company that plans to deliver payloads to the moon, has completed a $2.5 million seed round led by Space Angels Network. The company was originally spun out of Carnegie Mellon University in 2007 to compete for the Google Lunar XPRIZE (GLXP). As of today, they’ve secured 10 deals from governments, companies, universities, nonprofits and individuals for their first mission to the moon. Like many of the other 16 companies left in the GLXP, Astrobotic is hoping to win the $20 million Grand Prize by becoming the first privately funded rover to land on the moon, travel 500 meters, and transmit high-definition video and images back to Earth. But unlike the other GLXP competitors, Astrobotic is unique in that they’ve created a rideshare platform for other space agencies or companies to send their payloads to the moon. Interestingly enough, two other GLXP competitors have partnered with Astrobotic to land their rovers on the lunar surface. Chile’s AngelicvM and Japan’s HAKUTO are two GLXP companies that have partnered with Astrobotic to land on the lunar surface. HAKUTO, Japan’s sole entrant into the competition, will attach two rovers, known as Moonraker and Tetris, to Astrobotic’s lander. Similarly, Astrobotic will carry AngelicvM’s Uni (for “unity”) rover. Partnering with Astrobotic allows these companies to focus on roving, imaging and communication technology and leave the difficult entry, descent and landing up to Astrobotic. In terms of technology development, Astrobotic has proven themselves as a worthy GLXP competitor. In fact, Astrobotic is the only GLXP team that has won three out of three GLXP milestone prizes, totaling $1.75 million. Because of this, a NASCAR-esque race on the moon between companies from the U.S., Japan and Chile to win the $20 million Grand Prize certainly isn’t out of the question. Florida-based Moon Express (which has raised more than $30 million) and Germany’s Part-Time Scientists each won two GLXP milestone awards. Ultimately, Astrobotic seems happy to work with any space agency or commercial company who is willing to pay the $1.2 million per kilogram price tag. Any payload that’s brought to the moon by Astrobotic will have to stay there for now. Thornton said that they don’t intend to bring anything back to Earth on their first two lunar missions, but eventually they could do a scientific sample return once they increase their payload capacity. With the additional funding, Astrobotic plans to accelerate the development of their Griffin lander, which they are co-developing with NASA . Since 2007, Astrobotic has received 21 contracts from NASA, totaling several million dollars. 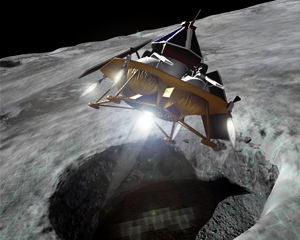 Astrobotic is one of the three companies NASA has partnered with through the Lunar Cargo Transportation and Landing by Soft Touchdown (CATALYST) program to advance robotic lunar landing capabilities. One of the next big steps for Astrobotic will be to secure a verified launch contract. Two GLXP teams — Moon Express and Israeli company SpaceIL — have already secured verified launch contracts with RocketLab and SpaceX, respectively. Both companies plan to launch in 2017. Thornton stated that they will reserve a launch contract of their own once their manifest is full enough to fly. He expects that they will launch in the next couple of years. Regardless of who wins the GLXP Grand Prize, however, the lunar show will go on. Like other GLXP frontrunners, Astrobotic plans to continue business as usual after GLXP is said and done.